It has been suggested that Men are from Mars and women are from Venus. This is not true. Women in fact come from the planet Vargos 5 in a galaxy far far away from rational thought. This planet exploded several million years ago but a party of women escaped in a space ship. It took them 40 years to reach Earth as they took some wrong turnings and had the map upside down. The planet Vargos 5 was plagued with shortages. 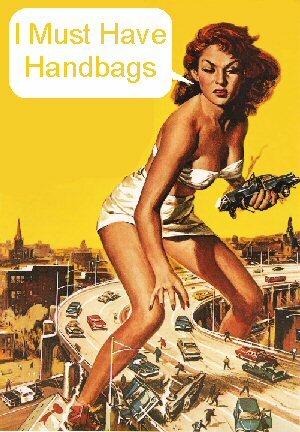 There were handbags and shoe famines lasting years on end and evolutionist believe that these caused hoarding behaviour in women to become genetically programmed. On Vargos 5 handbags and shoes were also destroyed by direct sunlight hence the need to keep them in dark cupboards and never wear them. Instead of gravity, Vargos 5 had another force that caused objects to be drawn towards large groups of retail outlets. This explains why women often find themselves inexplicably driving towards Bluewater and Arndale. The shops on Vargos 5 had no windows and no signs indicating what they sold. On Earth this has created a difference in the way people shop: Men want to buy something and therefore go into a shop, whereas women don’t know what they want to buy until after they have gone into the shop whereupon, by some strange serendipity, they discover an item they desperately needed to buy all along. Like Egypt at the time of Joseph, Vargos 5 was a planet plagued alternatively by famine and excess. During years of plenty, huge warehouses were filled with Slimfast Banana Flavoured Milkshakes which, during famines, would be the sole diet of the women. Naturally in years of plenty, women would engorge themselves with high calorie foods such as Terry’s Chocolate Oranges, Hobnobs and Haagen Daz Vanilla Caramel Brownie Ice Cream in order to be better prepared for the years of famine ahead. The courts of Vargos were only allowed 2 verdicts: Guilty and Really Really Guilty. This is thought to be the reason that women feel guilty all the time. Alternatively this may be because they do actually neglect their mothers and watch telly and eat biscuits all day instead of playing with the children. For reasons related to special relativity all inanimate objects on Vargos 5 are extremely hard. Grass for example is spikey and unyielding. For this reason, many cushions are required to protect the women from the hard edges. This is why women on Earth buy huge numbers of cushions on things that don't need cushions such as sofas and beds. On Vargos 5 clothes were made of an unstable substance called Veloxinium. Veloxinium gradually expanded over a period of months. This accounts for the fact that women always buy clothes one size too small on the basis that they will be able to get into them by the summer. There were no men on Vargos 5 but occasionally the planet would be visited by males known as Cosmic Clowns who travelled the universe doing hilarious routines whilst being naked apart from a policeman’s helmet. This explains why men watching strippers are always very serious, whereas women watching strippers are always in paroxysms of hysterical laughter. The electicity supply on Vargos 5 was spasmodic so there was a great need for candles all over the house. Also the pervading smell on the planet was of rotting cabbages, hence the need for the candles to be scented. This explains why the women of Earth buy huge numbers of scented candles which are completely pointless and are therefore stored in a cupboard somewhere which the women won't go near in case of spiders (All spiders on Vargos 5 are venomous in inverse proportion to their size). The strangeness of women has led to many unnecessary arguments and male readers will find all arguments will be prevented if you follow our simple guide below. A women goes into a shop (no surprise so far) and chooses 2 items and asks you which you prefer. Does this skirt make me look a bit tarty? You’re a bit old to worry about that aren’t you? I’m turning into my mother aren’t I? You’re nothing like your mother. Look there’s a new romantic comedy at the Odeon. Shall we go?